Measuring the premium a waterfront Property Generates in Key cities around the world. Water resources have long played an important role in the pattern of human settlement. Today however, owning a slice of a prime waterfront is less to do with its transport or agricultural value and far more to do with the iconic views and lifestyle it affords. From the panorama of Sydney Harbour to the serenity of Lake Geneva and from Hong Kong’s bustling waterways to the iconic Thames skyline, waterfront addresses are amongst the most desirable in the world. Such is the demand for frontline property, be it on a beach, river, lake or harbour we thought we’d take a closer look at what price premium such properties generate and how this varies around the world. 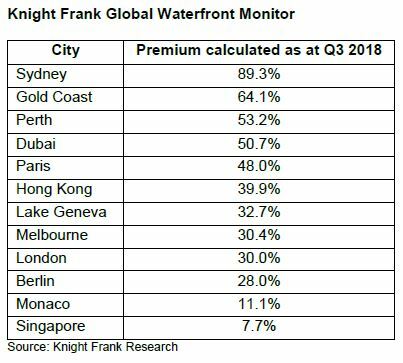 According to the new Knight Frank Global Waterfront Monitor, compiled by valuations from our global network, prices for prime waterfront properties are on average 40% higher than comparable properties inland. The index measures the potential value uplift for prime homes on the water’s edge compared with similar properties located further inland without access to, or a view of, water. Not all prime waterfront properties are equal, however, and much like the diverse nature of global property – from luxury apartments in Chelsea to sprawling villas in Dubai and converted warehouses on Berlin’s River Spree, premiums vary by location and amenity. Our data shows that individuals from all over the world searched for prime waterfront property last year, led by prospective buyers from the UK, US, Canada and Australia. The lifestyle and additional amenities that a waterfront home offers is a key motivation for many buyers. From private moorings to jetties and quays, waterfront properties offer easy access to numerous watersports along with an ever-changing panorama. By classifying each property according to its characteristics and exact location, our data reveals that being located alongside a harbour generates the highest premium of 59.1%. However, at 58.5%, a beachfront home is not far behind with Sydney and the Gold Coast registering some of the highest uplifts. Water has global appeal, by producing negative ions it boosts energy with research showing it has significant health benefits. For one particular world region – arguably the most important for global markets in today’s world – Asian and especially Chinese buyers, water is more than a mood enhancer but of critical importance when considering both where and the type of property to purchase. Feng Shui (Shui meaning water) is usually fundamental to Chinese buyers’ decision-making. Water signifies wealth in Feng Shui and can bring good fortune and prosperity. It should be slow moving and clean, rather than stationary and stagnant. The property should be elevated above the water and if on a river, should ideally be positioned on a winding section where the pace of flow is slower. Fast moving streams and rivers are often avoided as this suggests wealth is rolling away. 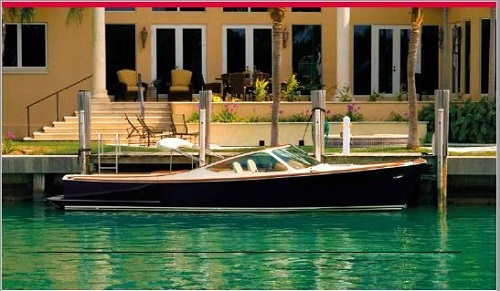 Waterfront properties are also amongst the most liquid (no pun intended). Even in a depressed market, due to their position and scarcity, a frontline waterfront property will face strong demand with prospective buyers aware that their future exit strategy will also be assured. Perth (53%), Dubai (51%) and Paris (48%) sit mid-table but unlike Paris, where new-build opportunities are scarce and waterfront homes are older high-ceilinged Haussmann homes along the Seine, both Perth and Dubai’s offering in terms of waterfront living is skewed towards new-build beachfront living. In Geneva, Cologny is the city’s most desirable neighbourhood, however, the main Quai de Cologny road runs along the perimeter of the Lake inhibiting the view from this exclusive enclave. Instead, those seeking a lakeside home look to the neighbouring villages of Vésenaz or Anieres. Here, a frontline property sees a premium of 33%. Properties on the edge of the Thames in London generate a premium of around 30%. The Knight Frank Riverside area, which stretches from Fulham to Southwark, is made up of around 13,000 properties, yet this narrow belt alongside the Thames accounts for only 0.4% of the Central London’s 3.7 million housing stock. This scarcity of supply explains the uplift, a trend that we are seeing reflected globally. At 2.02 square kilometres, Monaco (11%) is the world’s second-smallest state and nearly all of its 1,839 homes have views of the Mediterranean. This, combined with the fact that the Rue de Princesse Grace hugs much of the coastline means being in the heart of Monte Carlo or buying an apartment on a higher floor to secure a prime vantage point is almost as desirable as securing a home with direct waterfront access. Analysis shows there is some correlation between the volume of water and the premium generated. Where water is in abundance – island properties such as Hong Kong and Singapore – the premium is smaller. Singapore registers the lowest premium (7%) and here our research confirms that sea views command a higher premium than river views.